Smack in the middle of awards season, there'll be a little thing happening called Sundance. Perhaps you've heard of it? Clearly we jest, as it seems that with every passing year the Sundance Film Festival becomes the place to see celebrities and be seen ogling them. 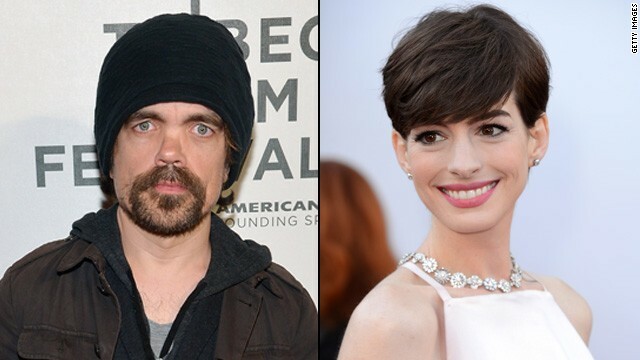 For the 2014 competition, expect to see several A-listers vying for the grand jury prize, including Peter Dinklage, Mark Ruffalo, Zoe Saldana, Philip Seymour Hoffman and Anne Hathaway. For a full list of movies to watch for next year, visit Sundance.org. Any of these pique your interest? "Camp X-Ray": Directed and written by Peter Sattler, this film first made headlines because of the idea of Kristen Stewart basically being sent to Guantanamo Bay. Indeed, the former "Twilight" star plays "a young woman stationed as a guard in Guantanamo Bay, where she forms an unlikely friendship with one of the detainees." Payman Maadi, Lane Garrison, J.J. Soria and John Carroll Lynch also star. "Cold in July": Directed by Jim Mickle and co-written by him and Nick Damici, this film centers on the life of a small-town Texan, whose existence "unravels into a dark underworld of corruption and violence" after he kills a home intruder. It stars Michael C. Hall, Don Johnson, Sam Shepard, Vinessa Shaw, Damici and Wyatt Russell. "Dear White People": This project, directed and written by Justin Simien, has already gained a healthy amount of buzz on the Web. It centers on "four black students attending an Ivy League college, where a riot breaks out over an 'African American' themed party thrown by white students. With tongue planted firmly in cheek, the film explores racial identity in post-racial America while weaving a story about forging one's unique path in the world." The project stars Tyler Williams, Tessa Thompson, Teyonah Parris and Brandon Bell. "Fishing Without Nets": Directed by Cutter Hodierne, who co-wrote the film with John Hibey and David Burkman. It's "a story of pirates in Somalia told from the perspective of a struggling, young Somali fisherman." Among its stars are Abdikani Muktar, Abdi Siad, Abduwhali Faarah, Abdikhadir Hassan, Reda Kateb and Idil Ibrahim. "God's Pocket": "Mad Men" star John Slattery directed this feature and co-wrote the script with Alex Metcalf. The story follows a man named Mickey who tries to hide the "accidental" death of his stepson. "When the boy's mother demands the truth, Mickey finds himself stuck between a body he can’t bury, a wife he can’t please, and a debt he can’t pay." The cast includes Philip Seymour Hoffman, Richard Jenkins, John Turturro and Slattery's "Mad Men" co-star, Christina Hendricks. "Happy Christmas": Written and directed by Joe Swanberg (who also wrote and directed the well-received 2013 romantic comedy, "Drinking Buddies"), "Happy Christmas" is about a young woman who moves in with her older brother, his wife and their 2-year-old son after she breaks up with her boyfriend. In addition to Swanberg, the cast features Anna Kendrick, Melanie Lynskey, Mark Webber and Lena Dunham. "Hellion": Written and directed by Kat Candler, this one will likely appeal to those who are missing their Aaron Paul. The story follows a 13-year-old motocross and heavy metal fan named Jacob, whose delinquent behavior causes child protective services to send his younger brother to live with his aunt. In order to get him back, Jacob and his emotionally absent dad have to face their actions together. Along with "Breaking Bad" favorite Paul, this project also stars Juliette Lewis, Josh Wiggins, Deke Garner, Jonny Mars and Walt Roberts. "Infinitely Polar Bear": Maya Forbes both directed and wrote this feature about a manic-depressive dad who tries to get his wife back by taking full responsibility of their two young daughters. The film stars Mark Ruffalo, Zoe Saldana, Imogene Wolodarsky and Ashley Aufderheide. "Jamie Marks is Dead": Carter Smith directed and wrote this story about a man named Jamie Marks who finds he more loved in the afterlife than he was when he was living. "Hoping to find the love and friendship he never had in life, Jamie’s ghost visits former classmate Adam McCormick, drawing him into the bleak world between the living and the dead." The cast includes Cameron Monaghan, Noah Silver, Morgan Saylor, Judy Greer, Madisen Beaty and Liv Tyler. "Kumiko, the Treasure Hunter": Directed by David Zellner, who co-wrote the script with his brother Nathan, "Kumiko" tells the story of "a lonely Japanese woman becomes convinced that a satchel of money buried in a fictional film is, in fact, real." That belief causes her to leave behind a "structured life" in Tokyo for the Minnesota wilderness, where she starts to search for her fortune. This one stars Rinko Kikuchi. "Life After Beth": Written and directed by Jeff Baena, this is another feature film that focuses on life after death - in a sense. The story centers on a man named Zach who is devastated when his girlfriend, Beth, dies unexpectedly - but gets a second chance at love when she mysteriously returns. It stars Aubrey Plaza, Dane DeHaan, John C. Reilly, Molly Shannon, Cheryl Hines and Paul Reiser. "Low Down": Jeff Preiss directed this from a screenplay written by Amy Albany and Topper Lilien. The movie is based on Amy Jo Albany's memoir, and thus follows her "heart-wrenching journey to adulthood while being raised by her father, bebop pianist Joe Albany, as he teeters between incarceration and addiction in the urban decay and waning bohemia of Hollywood in the 1970s." It stars John Hawkes, Elle Fanning, Glenn Close, Lena Headey, Peter Dinklage and the Red Hot Chili Peppers' Flea. "The Skeleton Twins": Craig Johnson directed this feature from a script he co-wrote with Mark Heyman. The story follows a pair of estranged twins named Maggie and Milo who happen to cheat death on the same day, prompting them to reunite and figure out the reasons their lives went so wrong. With a cast like this, there's no way an audience is going to escape without laughter: Bill Hader, Kristen Wiig, Luke Wilson, Ty Burrell, Boyd Holbrook and Joanna Gleason star. "The Sleepwalker": Mona Fastvold directed from a script she co-wrote with Brady Corbet. A young couple named Kaia and Andrew are at the heart of this tale that depicts how their lives are "violently interrupted" when they receive unexpected visitors at Kaia's secluded family estate. "'The Sleepwalker' chronicles the unraveling of the lives of four disparate characters as it transcends genre conventions and narrative contrivance to reveal something much more disturbing." The cast includes Gitte Witt, Christopher Abbott, Stephanie Ellis and writer Corbet. "Song One": Kate Barker-Froyland directed and wrote this feature about a woman who returns home to her estranged family after an accident leaves her brother comatose. "Retracing his life as an aspiring musician, she tracks down his favorite musician, James Forester," and "against the backdrop of Brooklyn’s music scene," the two begin an "unexpected relationship." Anne Hathaway, Johnny Flynn, Mary Steenburgen and Ben Rosenfield star. "Whiplash": Damien Chazelle wrote and directed this project about a "talented young drummer who begins to pursue perfection at any cost" under the tutelage of "a ruthless instructor." It stars Miles Teller and JK Simmons. I like the midget, ha ha ha. Watch for a young street musician if you go. He was killing it there last year. Oh, he's an angry elf. Nothing but spam and poop comments in here any more. What a waste. Just shut it down. Spam and poop go hand in hand, in a way. Some might argue that Spam and poop are one and the same. So that's what that spam in a can is made out of. I wondered what those dusty cans were on the shelves at the grocery store were. Another question answered! Shut it down indeed. But first, come a little closer so I can deposit a warm loose stool upon your forehead.